Spice should give you plenty of room to play – from the winter warmers of egg nog, wassail and mulled products to the strange and interesting infusions of pepper, ceubub, grains of paradise, nutmeg — what have you! I would like to stretch the traditional meanings of spice (as the bark, seed, nut or flowering part of a plant used for seasoning) to basically anything used for flavoring that isn’t an herb. Salt? Go for it. Paprika? I’d love to see you try. I hear that cardamom is hot right now. It’s no secret that I’m a huge fan of gin. So it felt natural to look at the defining spice of gin, juniper, for this Mixology Monday. The juniper flavor in gin comes from the juniper berry. Juniper berries are actually cones with unusually fleshy and merged scales, giving them a berry-like appearance. When immature, the cone is green. It matures into a purple-black color. Gin is usually made with fully grown but immature berries, which have a flavor that is dominated by pinene, the chemical compound that gives pine resin its distinctive smell. Junipers are a distant relation of pines. As the berries mature, their flavor is balanced by “green-fresh” and citrus. It’s these darker, mature berries that are dried and used as a spice for food. Juniper berries are a popular winter spice, melding well with other cold season favorites such as clove, cinnamon, and allspice. And while some poor quality gins can be faulted for tasting too much like a Christmas tree, that scent and smell is very seasonally appropriate! Juniper berries have been used as a medicine and flavoring for thousands of years. At least two species of juniper berries were found in King Tutankhamun’s tomb, one of which does not grow in Egypt and was likely imported from Greece. In Greece, juniper berries were used by athletes at the Olympic games who believed them to improve stamina, one of the first performance enhancing drugs. 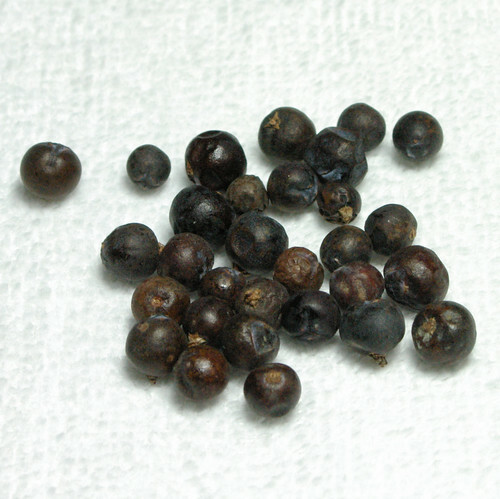 The Romans used juniper berries as a replacement for black pepper. Gin itself, like so many other liquors, was originally created as a medicine, and its English name comes from the Dutch word gevener, meaning juniper. I decided I’d start by making a juniper berry infused simple syrup. Lightly crush 15 of the berries (I used a meat tenderizer), and place all ingredients in a small sauce pan. Bring to a boil and simmer for 20 minutes. Remove from heat and let steep for at least four hours. Strain off solids and bottle. This gives off a pleasant scent of juniper while on the boil. The resulting syrup has a bright, spicy flavor that isn’t too overpowering. I find the best way to start experimenting with new infused simple syrups is to substitute them in favorite recipes. I looked over the list of my favorite drinks, and decided that the best way to try out the juniper berry syrup was in a whiskey sour. Put ingredients in shaker. If using egg white, give a dry shake (no ice) for at least 10 seconds. Add ice, shake until good and cold. Strain into cocktail glass. 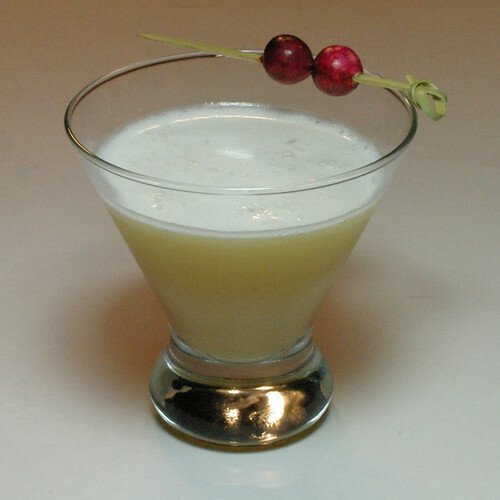 Garnish with cranberries. I was inspired by the use of bourbon as a winter spirit, and I was not disappointed. The juniper berry syrup provided a bright, clean counterpoint to the bourbon and lemon, making this is a very enjoyable drink. The pinene exists mostly in the aftertaste, but very subtly. I’m very pleased with how the juniper blends with the bourbon, and will experiment with some other combinations. I’m tempted to try a daiquri with the juniper berry syrup, but not quite sure how that will work. Thanks, Craig, for a great MxMo theme. Be sure to check out his site for the roundup! I really like your site. I didn’t know about the immature juniper berries in gin until now – I thought the dark culinary ones were used! What a great melding of two disparate tastes: bourbon and juniper (gin). The egg makes the drink look frothy and light. Sounds terrific, Stevi. And the name is of course perect for this time of year. Happy Holidays!